As the title gives away, this is a thematic sequel to designer Ted Alspach’s Castles of Mad King Ludwig– itself a follow-up to his earlier game, Suburbia. In all the games, the idea is developing something (a suburb, a castle…) by playing tiles. 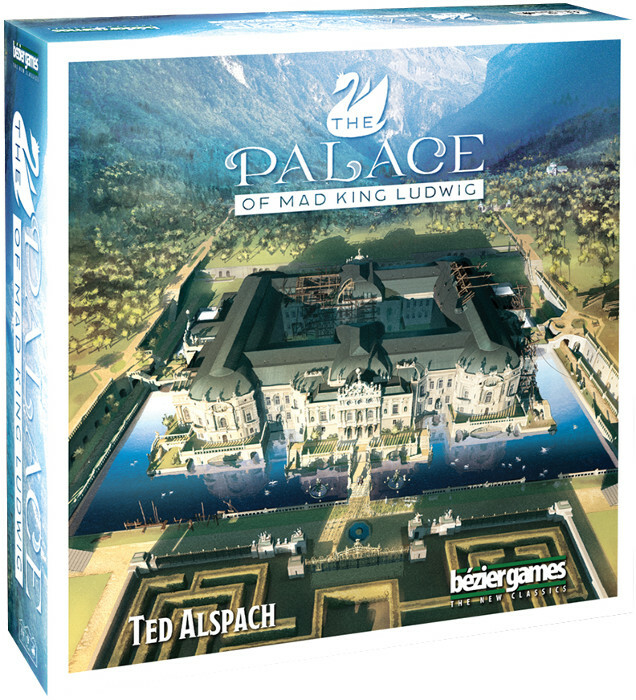 One difference in The Palace of Mad King Ludwig is that the players are all adding rooms (tiles) to the same edifice: the Palace. The types of room and how they score well be familiar to those who’ve played Castles of Mad King Ludwig but this game’s mechanisms are very different. To start at the beginning, the box contains square cardboard tiles: lots and lots of tiles. Most of these are the various rooms that players will add to the Palace. However, a lot of tiles are the moat, which will gradually build up along the edges of the Palace. The most common way the game ends is when the moat completely surrounds it. The game’s currency is swans (cardboard tokens in five colours), which are also worth points at the end of the game (for sets of different colours). Swans are spent to pick up room, “Bonus” or “Favor” tiles. Bonuses give players things like a discount when buying tiles, while Favors provide extra scoring opportunities such as points for the most rooms of a particular type. Some Favors are made public at the start of the game and can be scored at the end by any player. Players’ own Favors can only be scored by them. The obvious thing to do in a turn is to place a room, taking the tile from the row of available rooms (which may cost swans). There are several types of room, indicated by the tile’s colour and small icon. Each type has one or more doorways, shown by a coloured swan icon on the edge, and must be placed with at least one doorway connecting into the palace (this starts as a long hallway) and the player puts one of his markers on the room. If the colour on the connecting doorways matches, the players who own the connected rooms get a swan token in that colour. A room is complete when all its doorways are connected and it then scores, providing the room’s owner an immediate bonus (extra swans or a Favor, for example) or points at the end of the game, depending on the type of room. How a room scores is indicated on the tile with another small icon. However, a room can never be completed if any of its doorways has been blocked. This gives players the tactical opportunity of blocking the doorways of other players’ rooms to prevent them scoring. Hence, rooms with few doorways are both easier and more likely to complete. The problem with this is that playing only these rooms will limit your opportunities for expanding the palace. What’s more, you may have Favors that reward you for types of rooms with many doorways. Completing a room also triggers the addition of moat tiles to the palace – by the player who completed the room. Initially, this will actually be no moats but the number increases, accelerating as more room tiles are used. Of course, this hastens the end of the game. There are rules about how moat tiles are used but essentially they wrap round the outside of the palace, potentially blocking doorways and limiting players’ opportunities. Other actions available to players in their turn are to buy (with swans) a Favor or a bonus or to place one of the special types of room tile. There are two special rooms: hallways, which provide lots of doorways, and stairs, which connect downstairs (one type of room) with upstairs (all the other types of room). These count as rooms in all respects and are always available to players. The final element of the game is players’ individual boards. These have slots for the player’s Bonuses and Favors, which neatly limits how many a player can have. They also show tracks for each type of room. Players move a marker along the appropriate track for each room they add to the palace. There are bonuses during the game as they move along each track and bonus points at the end for complete rows and columns. Phew! There is an awful lot going on in this game. It’s hard to take all this in when you play for the first time – and I haven’t covered every detail. However, I reckon the key element to concentrate on is the Favors. First off, make sure you understand what each one scores for. Most of them are simply for having the most or least of something but do check. Second, aim to score as many of the public Favors as you can and keep an eye on what other players are doing in terms of qualifying for them. Though be careful of denying yourself other scoring opportunities in order to get a Favor: which is worth more? Third, do pick up some private Favors – either by spending swans or by completing rooms that give a Favor as their reward. Choose them with care, though – taking conflicting Favors is really shooting yourself in the foot. A final point on Favors: the rule is that nobody scores a Favor if more than one player achieves it. This makes the Bonus that lets you score tied Favors very useful and I recommend taking this.